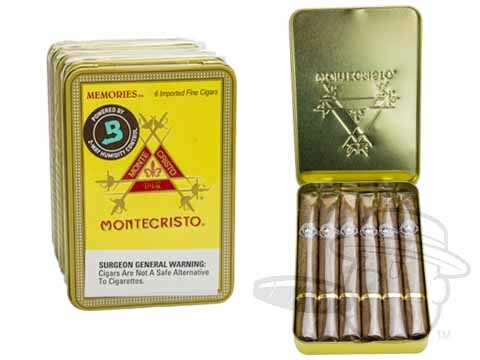 Enjoy the sweet aroma and rich flavor of Montecristo at any time at all with the convenient Montecristo Memories tins. These stout smokes make for a marvelous quick smoke, even when you’re on the move. Just like it's big brothers! After smoking a traditionally sized Montecristo cigar, these babies are practically the same thing! I have been smoking cigars for over 20 years. Now, I only smoke small cigars, one, maybe 2 a day (while driving my convertible sport car. For a long time, I had been searching for one that had a flavor, draw and burn that matched the premium cigars that I used to smoke. I accidentally stumbled on this cigar a week or so ago.This is the best little cigar by far I have ever smoked. I have never written a review before, on anything, because I usually don't have a positive opinion about that many things. In my opinion, you really can't beat this cigar. I wanted to have a quick 20-30 minute smoke available for a cruise I was going on. These fit the bill. The flavour was also pretty good, not too intense. All in all, a good choice. Montecristo Memories is rated 4.7 out of 5 based on 9 customer ratings.